managers — cannot afford to engage in that sort of self-delusion…. Consider, as one colorful example, the skiing industry. Beginning 10 years ago, the Aspen Skiing Company began noticing that European ski lodges were being slowly destroyed by warmer weather. Europe’s ski resorts tend to be located on lower mountains — about 6,000-8,000 feet high, compared to American peaks up around 11,000 feet — so they’re vulnerable to even extremely tiny increases in global temperature. The 2 percent temperature rise in the 20th century was enough “to put a lot of them out of business,” says Auden Schendler, executive director of sustainability for Aspen Skiing, which operates two resorts spread across four mountains. But now Aspen’s own season is getting shorter: “More balmy Novembers, more rainy Marches,” Schendler says. “That’s what we’re seeing, and that’s what the science suggests would happen. If you graph frost-free days, there are more and more in the last 30 years.” Climate-change models also predict warmer nights. Aspen Skiing has noticed that happening too, and the problem here is that nighttime is when ski lodges use their water-spraying technology to make snow — “and if you make it when it’s warmer it’s exponentially more expensive.” The increasing volatility of weather overall — another prediction of climate change — poses a particular danger for ski resorts, because they operate in the red most of the year, making up their deficit during the busy spring break in March. So if the weather is terrific for the entire winter but suddenly balmy during March break, that can ruin the whole fiscal year. So what is this “Climate Desk” thing, anyway? It’s a new collaboration between the Atlantic, the Center for Investigative Reporting, Grist, Mother Jones, Slate, Wired, and the new PBS current affairs show “Need to Know.” And it’s dedicated to reporting on climate change. But you probably already figured out that part. It’s kicking off with a two-week series of pieces about how businesses are adapting to climate change that includes both Thompson’s article and a piece by Felix Salmon explaining why business adaptation isn’t even more widespread. The main site is here. The RSS feed is here. 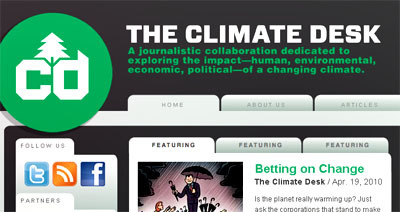 Or you can follow us on Twitter at theclimatedesk.